Even with some slowdown in TV advertising, TV’s biggest TV event, the Super Bowl, is estimated to rise again this year in total revenues — looking to surpass its $331 million mark of a year ago. 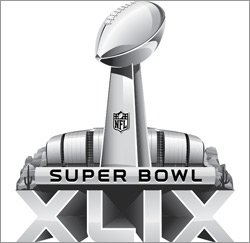 Total Super Bowl advertising rose 13.6% in 2014 to $331.8 million from $292 million in 2013, according to Kantar Media. Reports are that NBC is getting on average $4.5 million for a 30-second spot for the 2015 game, up from $4.2 million average for the 2014 game. “Healthy demand is expected to result in higher pricing for the 2015 game,” according to a report prepared by Jon Swallen, chief research officer of Kantar Media North America. Kantar Media notes the 30-second price tag has climbed 75% in the past decade with total advertising for the game, from 2005 to 2014 — pulling in $2.19 billion in TV advertising from 130 marketers. Super Bowl advertising took two dips in that 10-year period — for the 2010 game, declining $205.2 million from $213.0 million in 2009, in large part due to a great recession. It also sank in 2007, when it dropped to $151.5 million from $162.5 million in the previous year. Kantar notes that the five most recent Super Bowls have been the most ad-saturated in history. Last year, there were more than 49 minutes of advertising time, with 83 individual commercials overall. Some 40% of those commercials — 22 spots — were longer 60-second commercials, the highest share since the mid-1980s. TV advertisers are increasingly looking to connect digitally with viewers when it comes to their traditional TV commercials. Last year, 60% of TV spots (55 commercials) contained hashtags (#) mentions. Twitter says for the 2014 event, more than 24.9 million tweets about the football game and halftime show were sent.